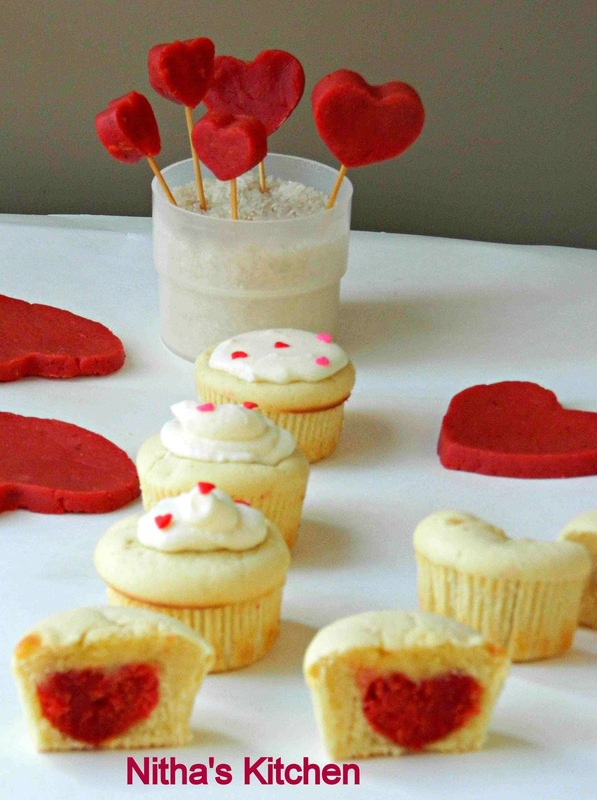 ones nevertheless how big or small let dig in to the recipe. 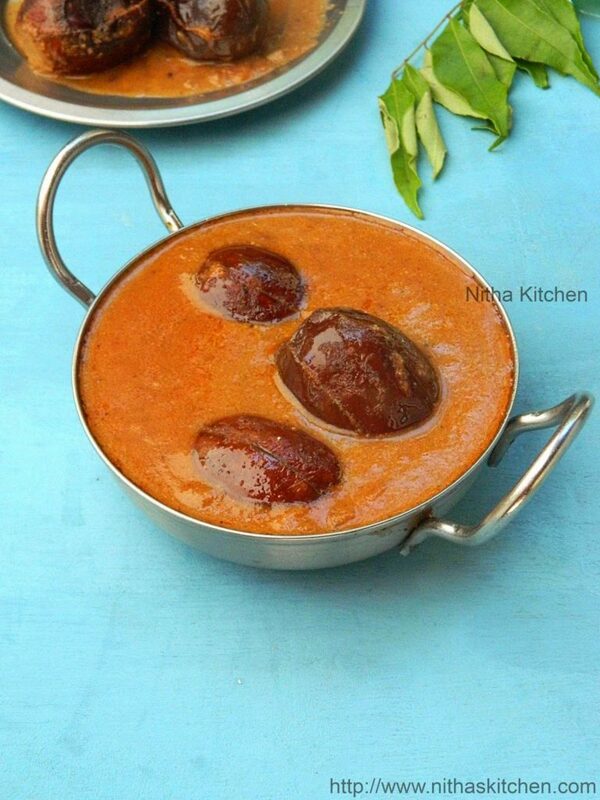 When comes to chettinad style ennai kathirikaai kuzhambu, brinjals are mostly deep fried in oil and then cooked with tamarind based curry, finally the left over oil is totally used in the kuzhambu they make so they floats in it!!! But here I shallow fried the brinjals in olive oil and used less oil for the curry so this is something healthier version i would say!!! Clean the brinjals, remove the stems (Optional) and slit all over it. Grind all the ingredients given under “for marinating” (Pic 1) with little water and make a thick paste. Coat the brinjals with thick paste as much inside the slits (Pic 2). Leave it as it is for 20-30 minutes at least. Meanwhile saute the ingredients given under “to grind”. Heat oil in a wide pan then add roughly chopped onion and sliced garlics. When onion changes translucent and brown, remove form heat. Add coriander powder and shredded coconut to it (Pic 3) and make a fine paste out of it. 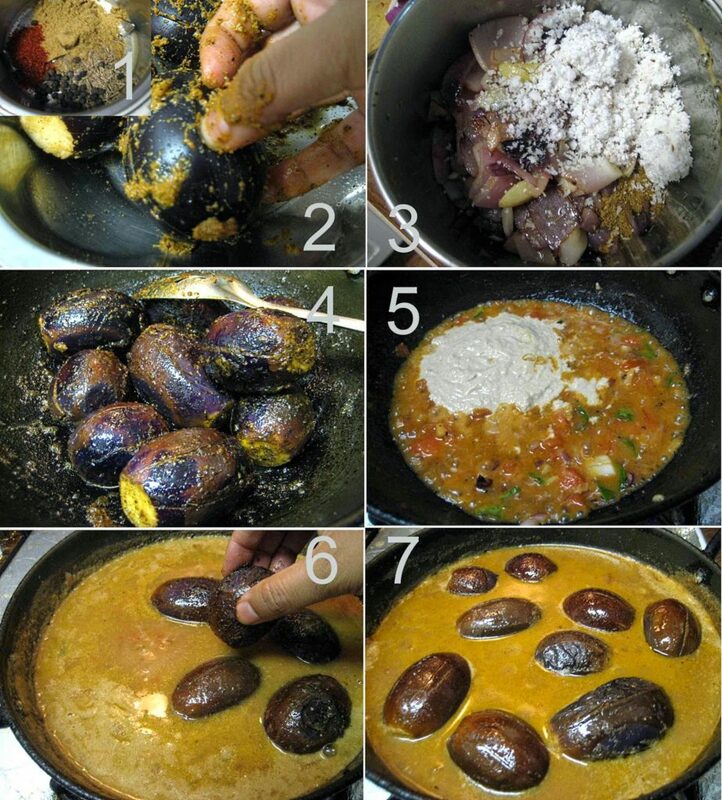 In the same pan add more oil , shallow fry the masala coated brinjals in medium flame till it shrinks in size (Pic 4). Gently flip at regular intervals and cook the brinjals. Remove them aside and add few tbsps of oil to the same pan. 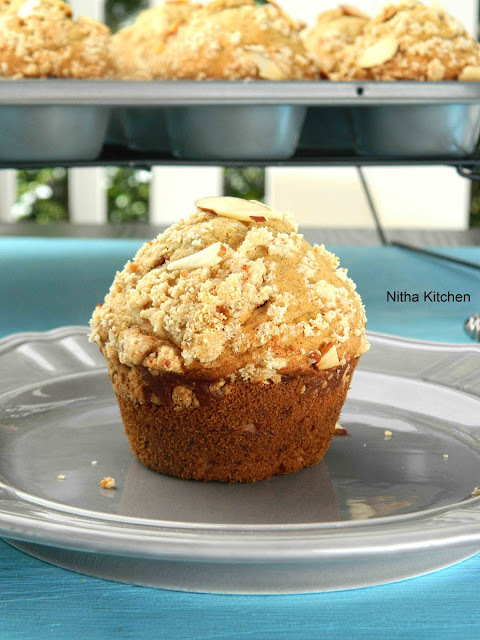 Temper with mustard or fenugreek seeds. Add chopped onion followed by tomato, curry leaves and turmeric powder. Saute till tomato mashes well then add red chili powder, tamarind juice and ground paste (Pic 5). Add enough water and bring it to boil. When boils well, add the sautéed brinjals and reduce the flame to low(Pic 6), cook it for 5-7 minutes or till brinjal cooks well n oil floats(Pic 7). Adjust red chili powder and salt before removing from heat. Optional to garnish with coriander leaves. Make sure brinjals cooked well before removing from heat. 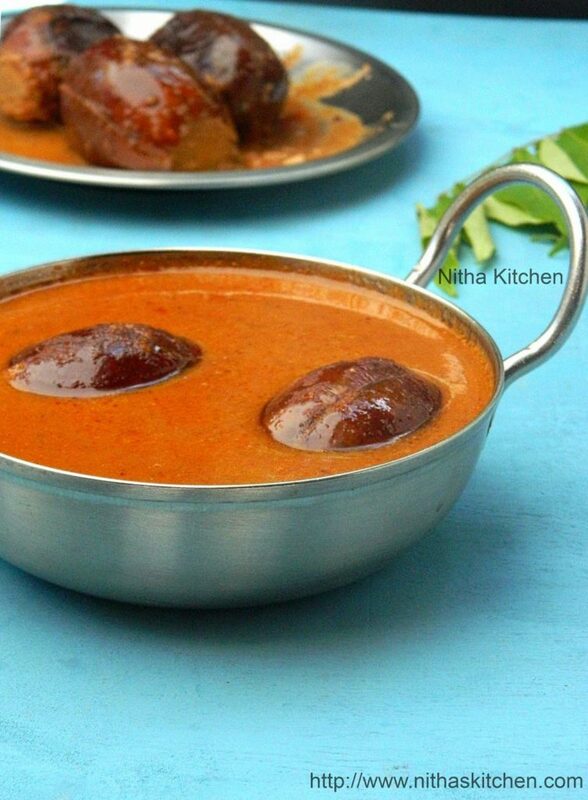 Tasty Ennai Kathrikka Kuzhambu. Love the way u have prepared this dish. 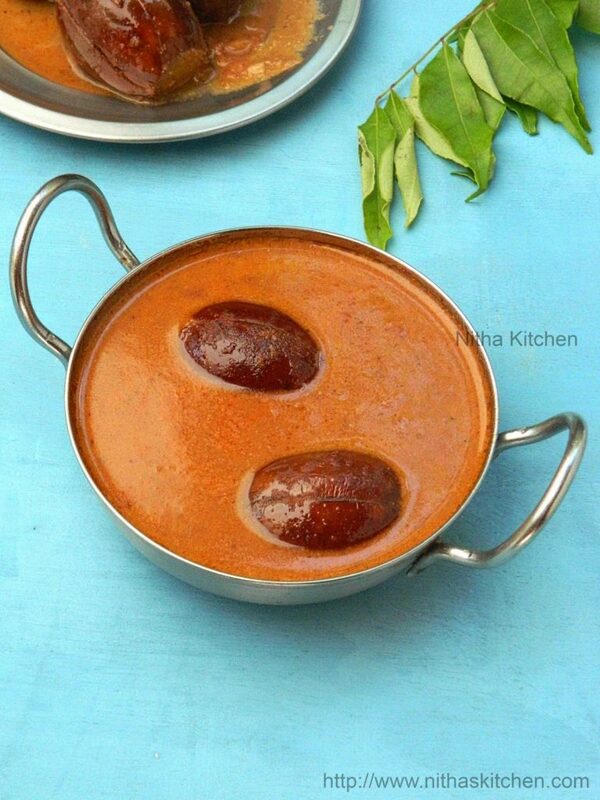 what a great coincidence,priya..I too just posted a chettinadu recipe..Your brinjal curry looks delicious dear,love the flavors !! tasty kulambu.. Can u pass me this with steamed rice? 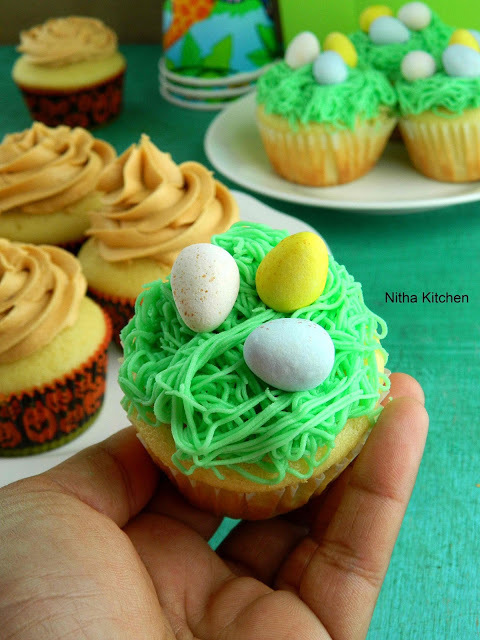 Looks delicious……. goes well with hot phulka! First of all very well explained 🙂 and so so tempting yenai kathirika 🙂 makes me drool here !! 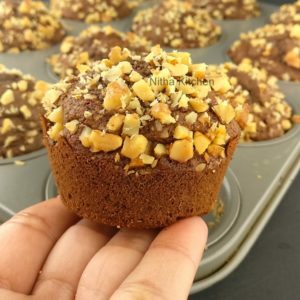 Ennai kathrikkai kulambu looks delicious. My mom makes similarly. love the pictures too.